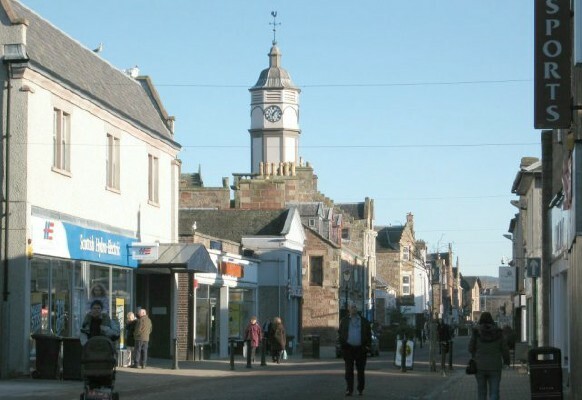 Dingwall High Street @ High.St - High Street shops and High St businesses. Large Google map of Dingwall High St.
Dingwall is a Royal Burgh and has been since 1226, just 12 miles (20Km) from Inverness. Much of the High Street is pedestrianised and mostly comprises small independent retailers to give a pleasant and traditional feel. Dingwall is historically a market town and this tradition carries on with a Farmer's market selling local produce. This is held on every second Saturday in the month down the High Street. The Town House (pictured) now houses the Dingwall Museum but was originally the tolbooth and town jail. Remnants from the original castle can also be found in the museum. More on the history and local attractions can be found on Dingwall's own web site.